What a full day! Started the day with Doris at the Kimochi Silver Bells Arts and Craft Faire at St. Mary's Cathedral. I don't think I've ever seen so many Asian-American artists and vendors and shoppers in one place before. There were so many talented artists and it's fantastic to be able to support them by buying their cool stuff. :) We saw quite a bunch of our crafty friends, too. One selling, one demoing, most shopping. I'll definitely try to go to this every year. We thought we'd only need about an hour there, but after an hour and a half we were forced to leave because the coins in our meter were running out, plus we had another Christmas party that started in 9 minutes and we an hour away and still had 2 more stops before getting there. Thankfully Chris didn't mind. In fact, everyone showed up to her casual get together around the same time. 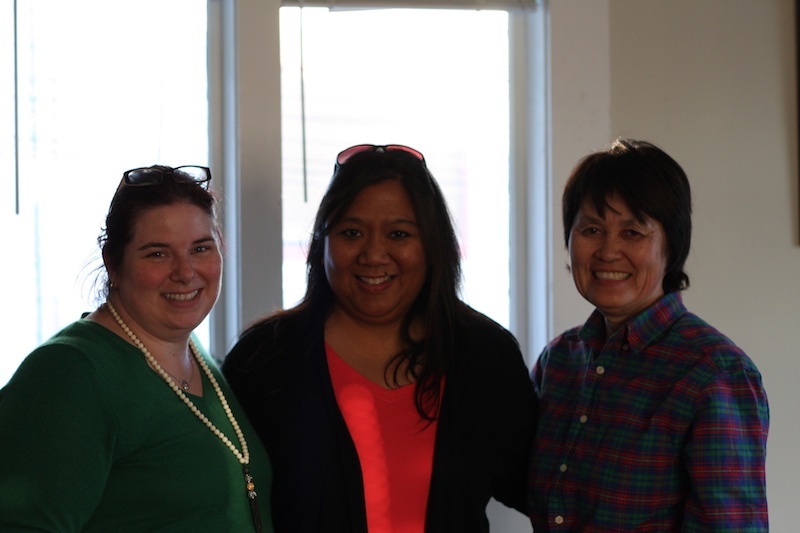 We had some fun and silly conversations and devoured her most amazing handmade caramels. 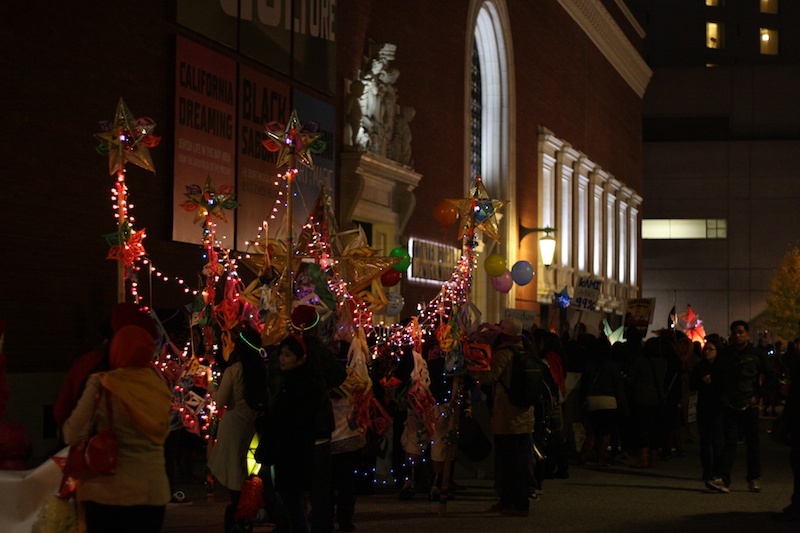 Doris and I had to leave a couple hours later because Jimmy and I were going to a Parol Lantern Festival back in The City. 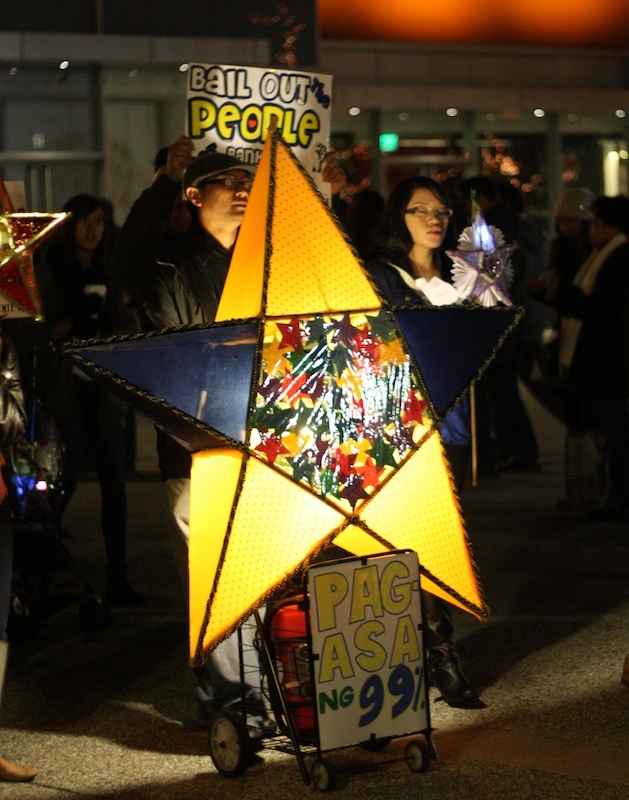 This was the 1st year I'd ever heard of a Parol Lantern even though it's a Filipino Christmas Tradition. Who knew? 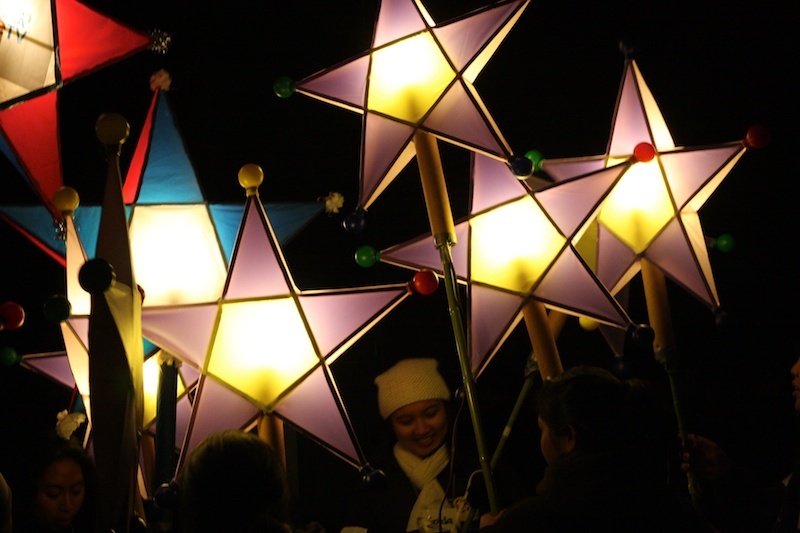 from wiki: A paról is an ornamental, star-shaped Christmas lantern from the Philippines. It is traditionally made out of bamboo and paper and comes in various sizes and shapes, but generally the basic star pattern remains dominant. The design of the paról evokes the Star of Bethlehem that guided the Three Kings to the manger. 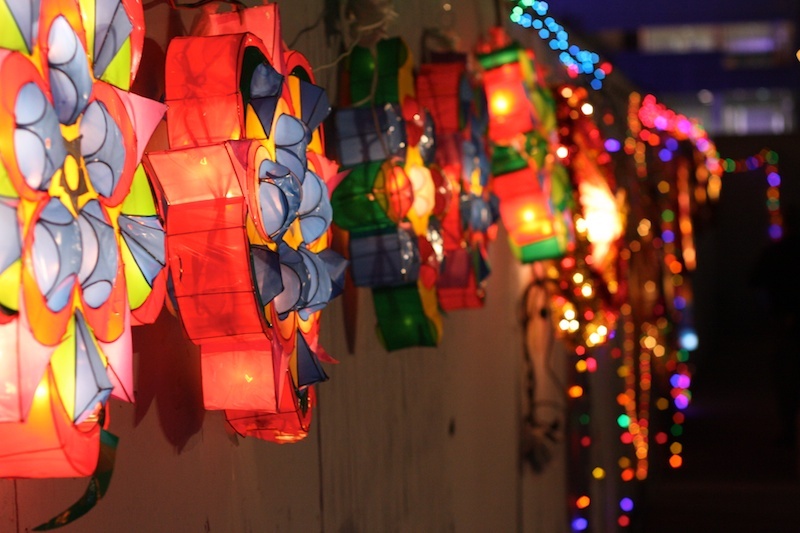 It also symbolizes the victory of light over darkness and the Filipinos' hope and goodwill during the Christmas season. 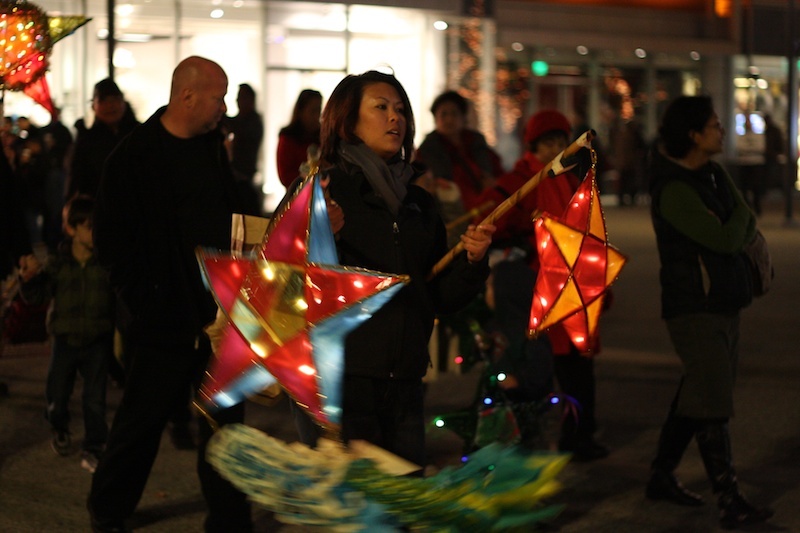 This is the 9th year that Yerba Buena Gardens has hosted the Parol Lantern Festival and Parade. 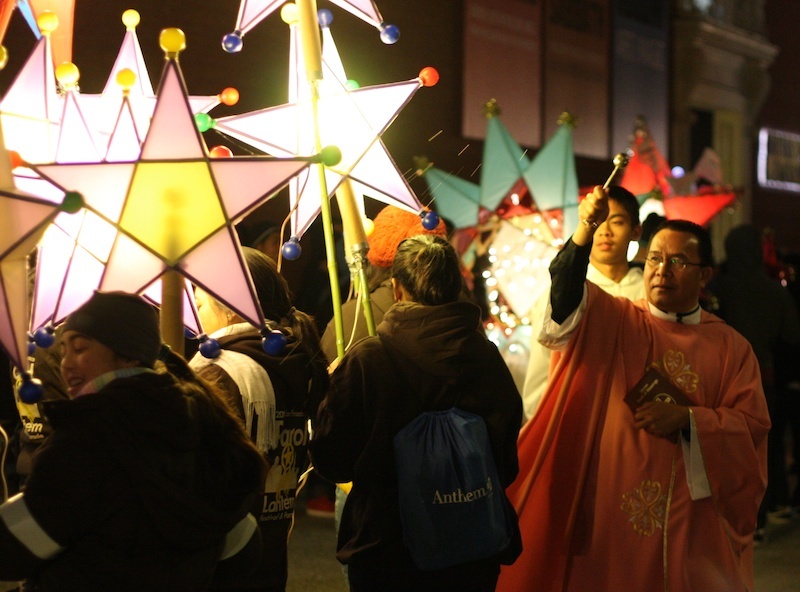 Participants make Parol Lanterns and walk in the parade, ending at St. Patrick's Church in Jessie Square. 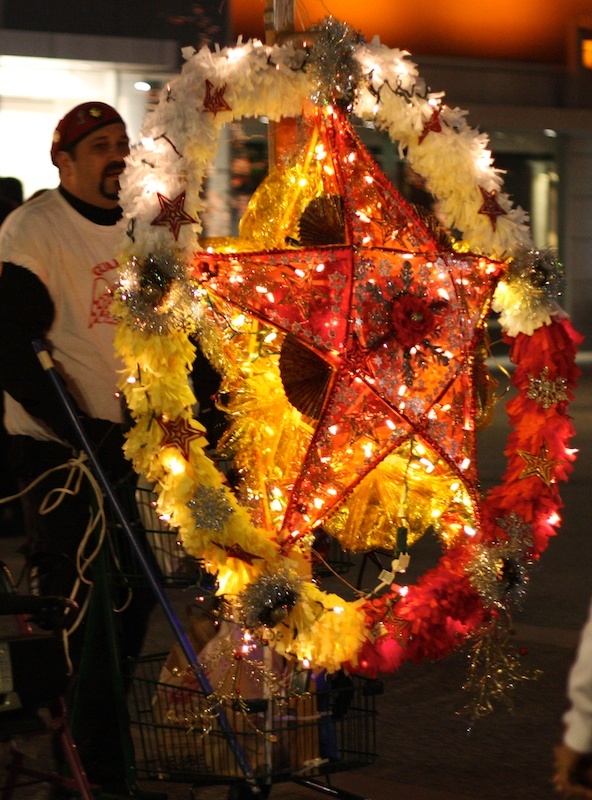 The Parols are all different sizes but were always shaped in the form of a star. The festival starts after dark, which of course makes the lanterns oh.so.very beautiful and give much more of an impact. The priest of St. Patrick's Cathedral blesses all the Parols with holy water. The Occupy Movement even found it's way into the festival. 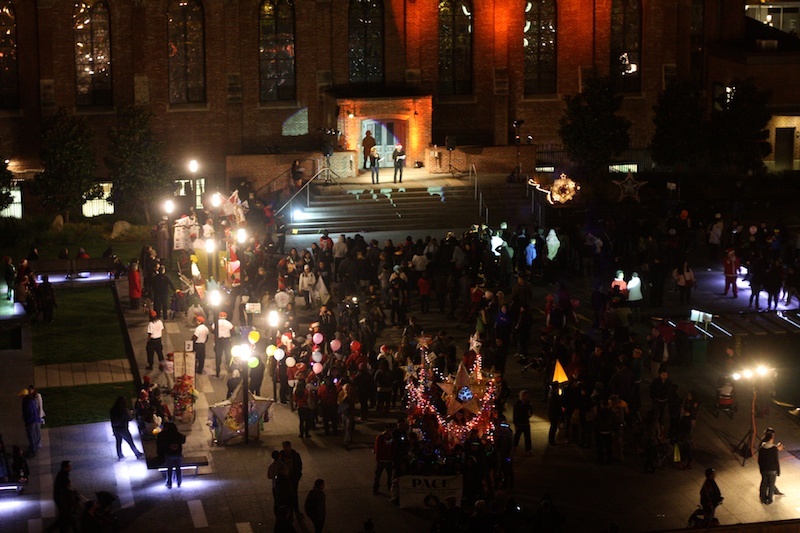 The parade makes its way in front of the Contemporary Jewish Museum. Such a beautiful building. At the end of the parade, everyone gathers by St. Patrick's in Jessie Square. Each organization in the parade gets to do a little performance. 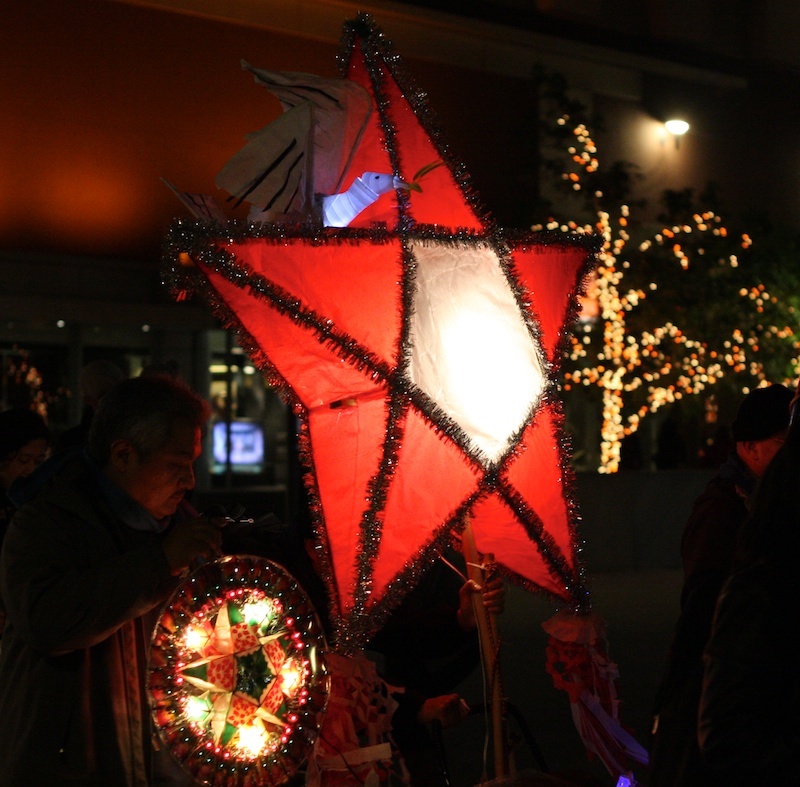 One side of the square was lined with Parol Lanterns. 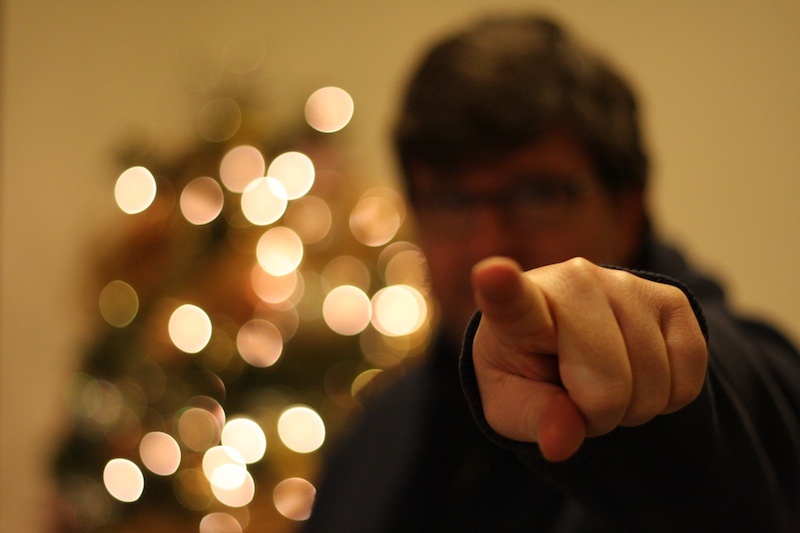 A perfect opportunity to take a snapshot of my handsome husband. Snapped another fun pic of him in front of the Christmas tree in the lobby of his office building, which happens to be right next to Jessie Square. How convenient! 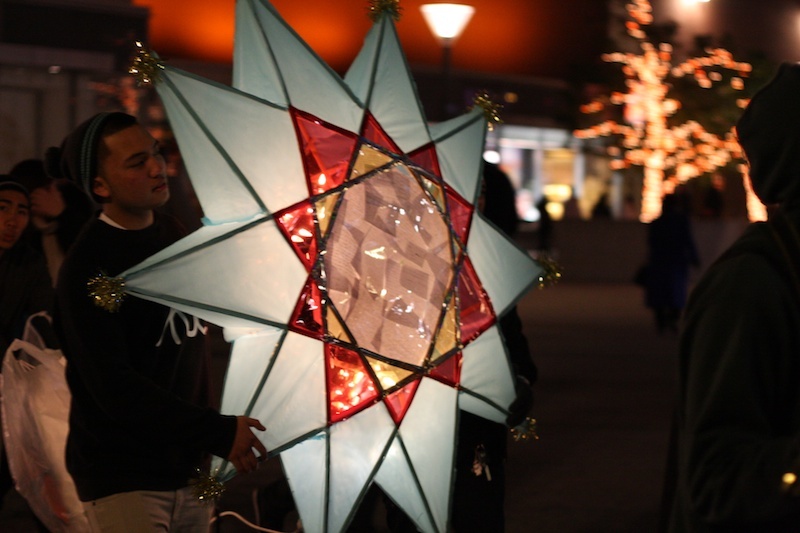 If you want to know how to make a Parol Lantern, this video gives an amazing step-by-step tutorial. 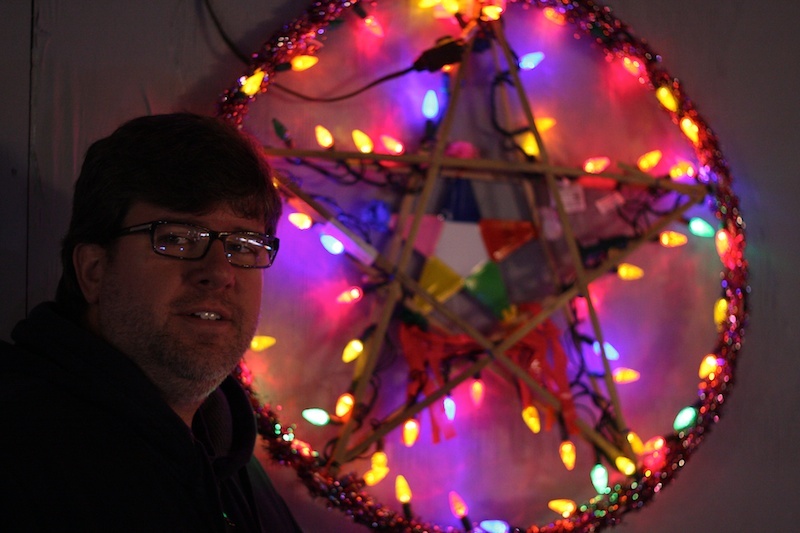 The Parol Lanterns are amazing. You sound to have had a very busy but exciting day. I don't know about this. I'll keep an eye on this next year. Thanks.